An announcement came from the Consistory last week (repeated today) requesting the congregation to submit names of brothers deemed suitable for the office of elder or deacon. Next week, the Lord willing, the Consistory will put together a slate of nominations from which the congregation will be requested in due time to elect the required number of brothers. One wonders: why do we follow this method to obtain new office-bearers? Shouldn’t consistory just appoint some brothers? Or should we perhaps simply cast lots? What involvement should the congregation actually have in this procedure? My intent today is to investigate why we do it the way we do, and then to list the consequences that follow. Scripture makes clear that none else than God Himself calls people to office. In the Old Testament God, for example, determined who could serve in the office of priest. He said to Moses, “Have Aaron your brother brought to you from among the Israelites, along with his sons…, so that they may serve Me as priests ” (Exodus 28:1). Equally, God determined who should be the priest’s assistants: “The Lord said to Moses, ‘Bring the tribe of Levi and present them to Aaron the priest to assist him’” (Numbers 3:5f). There was no room here for volunteers, or for a popular vote. The same is true in relation to Old Testament prophets. Concerning Jeremiah one reads: “The word of the Lord came to me, saying, ‘Before I formed you in the womb I knew you, before you were born I set you apart; I appointed you as a prophet to the nations” (Jeremiah 1:4,5). Moses (Exodus 3:10), Gideon (Judges 6:14), Samson (Judges 13:5), Samuel (1 Samuel 3:10), Saul (1 Samuel 10:2), David (1 Samuel 16:12f), and Isaiah (Isaiah 6:8f) all serve as other examples of men who were very obviously called by God to a particular office amongst God’s people. Even Jesus Christ “did not take upon Himself the glory of becoming a high priest. But God said to Him: ‘You are My Son, today I have become Your Father’” (Hebrews 5:5). Similarly, the Lord Jesus called the disciples to their office; none of them volunteered. Concerning the elders of Ephesus we read Paul is emphatic that “the Holy Spirit has made you overseers” over the flock (Acts 20:28). Office-bearers throughout the ages, then, receive their office from the Head of the Church. That is why no man is permitted to elbow his way into the office today, nor is any to push his friend into the office. Rather, “he shall wait for the time that he is called by God so that he may have sure testimony and thus be certain that his call comes from the Lord” (Belgic Confession, Article 31). Still, the question arises as to how the Lord God calls men to the offices of the church. In the Old Testament the Lord called many to office by a direct word of revelation. Through a precise command to Moses, God specified that Aaron had to be the high priest. God stipulated too that the next high priest was to be the oldest son of the high priest currently in office – and God Himself, of course, determined in His providence who the oldest son would be. The same is true of the kings of Judah. Of the prophets too it is evident that God called them. The quote mentioned above in relation to Jeremiah serves as an example. The Lord Jesus also very directly called the disciples to their office. There is a change on this point as a result of the outpouring of the Holy Spirit. Due to the Spirit’s renewing presence, the congregation is equipped to think things through and so (under the leadership of existing office-bearers) responsible to make decisions. Some examples from the book of Acts demonstrate the point. The Lord Jesus had appointed 12 disciples. But a vacancy existed in the group of twelve, since Judas had committed suicide. How was a replacement to be found? The procedure followed is outlined in Acts 1:15-26. One does not read that the remaining eleven unilaterally appointed Matthias to replace Judas. Rather, Peter (on behalf of the eleven) approached the congregation and sought their assistance in filling the vacancy. In verse 23 we read, “So they proposed two men: Joseph … and Matthias.” It is unclear who is meant in this passage by ‘they’, but the context suggests that it was the congregation under the leadership of Peter and the other ten disciples. “Then they prayed, ‘Lord, you know everyone’s heart. Show us which of these two You have chosen to take over this apostolic ministry….’ Then they cast lots, and the lot fell on Matthias; so he was added to the eleven apostles” (verses 24-26). It’s clear that the congregation was involved, possibly in proposing the candidates and certainly in praying. Then “they” cast lots, and the term ‘they’ in this instance certainly includes the involvement of the congregation. Nevertheless, it was God who called to office, for “the lot is cast into the lap, but its every decision is from the Lord” (Proverbs 16:33). A second example of God calling a person to office through the involvement of the congregation can be found in Acts 6. One reads in verse 1 that the widows were being neglected even while the number of disciples was increasing. Consequently, the twelve apostles called together the whole congregation and gave this charge: “Brothers, choose seven men from among you who are known to be full of the Spirit and wisdom…” (verse 3). “This proposal pleased the whole group. They chose Stephen, a man full of faith and the Holy Spirit; also Philip, Prochorus, Nicanor, Timon, Parmenas, and Nicolas…. They presented these men to the apostles, who prayed and laid their hands on them” (verses 5,6). Though the initiative lay with the existing office-bearers (the apostles), it is evident that the congregation played a central role in calling these brothers to their office. That God Himself with His blessing was ultimately behind their calling is evident from the “wisdom and the Spirit” by which Stephen, for example, spoke (Acts 6:10). In Acts 14:23 we read, “Paul and Barnabas appointed elders for them in each church and, with prayer and fasting, committed them to the Lord.” The word “appointed” means literally “elect by raising hands”. Although our translation does not seem to suggest the congregation’s involvement in the appointment of the elders, the reference to designating a person by raising one’s hand does suggest the congregation’s direct involvement. “The election to any office shall take place with the cooperation of the congregation, after preceding prayers…” (Article 3). The reference to prayer is striking – and predictable. Recall that the passages quoted above from Acts 1, Acts 6 and Acts 14 all make mention of prayer as a critical step in the calling procedure. The believers of the early church gave themselves to praying for office bearers because they understood that it is ultimately God who calls to office, and the congregation (under the consistory’s leadership) forms the tool by which God indicates the man of His choosing. So it is fitting and proper that the church petition the Lord to make clear whom He wants as shepherds over His people. In fact, there was a time in the history of the church that before a minister was to be called the congregation gave itself to a day of fasting and prayer…. How, then, is the congregation concretely to be involved? Three steps need our attention. The congregation needs to pray that the Lord God will supply the office bearers the congregation needs. This should be done not just in church services, but also in the homes. We cannot expect to receive good office bearers if we do not ask the Lord to provide suitable brothers. This is the more pressing when it comes to nomination time; let the congregation prayerfully look about for whom the Lord has prepared for office. The congregation needs to draw to consistory’s attention those in their midst whom (in their considered judgment) the Lord has prepared for office. Of course, letters of nomination should include also the reason why one thinks a particular brother has been prepared for office, for the brothers reading your letter might not see things your way if you do not argue your case. You will notice: congregational involvement is not limited to suggesting names or to voting. Rather, the emphasis for congregational involvement falls on (ongoing) prayer – in church, in the home, and personal. This is something for the entire congregation, older and younger, men and women, to do. That is why the congregation should be present at the election meeting, and not just the men. Central to that meeting is not ticking a ballot; central is prayer for guidance and wisdom. It is God who calls brothers to office. He in His providence, however, is pleased to use the congregation as His tool to specify which brothers are to become office bearers. This is a responsibility the congregation needs to take seriously. Consequently, when a person becomes an office-bearer (that is, when he gives his affirmative response to the questions put to him at his ordination), he must say in so many words that he is convinced “that God Himself, through His congregation, has called [him] to [his] office.” The conviction that it is God who calls is what makes the office so serious. At the same time, it’s that same conviction that gives the brother the assurance that God will give the strength to do the task. 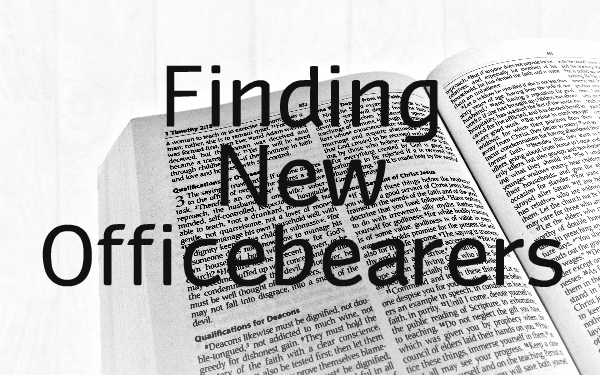 Meanwhile, the knowledge that the congregation continues to pray for the office bearer is most encouraging for the brothers as they set themselves to carrying out the office God has laid on them. “Form for Ordination of Elders and Deacons”, Book of Praise, p. 632. Previous How Should the Pulpit Address the Pew?